Ships from and sold by A Life in Harmony Amber. TESTIMONIALS: "Love them, my baby is responding fantastically!!! No more sleepless nights :)" ★ "BEST THING EVER! Baby slept all night toddler not as cranky, beautiful + amazing" ★ "Worked as soon as we put it on, reduced the swelling and redness on his cheeks" ★ "AGBA cert is legit. necklace is working. everyone sleeping well & all very happy" ★ "Worked within hours of wearing, no more nurofen needed!" ★ "Beads are working, good night's sleep, settle easier, a lifesaver thank you"
THE MAGIC OF BALTIC AMBER: the natural chemical-free way to help relieve your baby's teething pain, drooling, and sleepless nights. Baltic amber is the fossilised tree resin of ancient conifer trees and when worn against the skin Amber releases natural healing oils that are absorbed into the bloodstream. Jewellery made from Baltic amber beads have been widely and famously used throughout the world for centuries as a natural remedy for babies going through teething and growing pains. A TRUSTED SELLER: A LIFE IN HARMONY, while new to Amazon, is eBay Australia's largest Baltic Amber store, with over a decade of sales experience to thousands of customers with overwhelmingly positive feedbacks. As a health store, our focus is on supplying authentic Baltic Amber that has a genuine healing benefit, which our customers will attest to. This is a quality product backed by a trusted Australian seller with customer support available through Amazon, Facebook, our online store and eBay. INTERNATIONALLY CERTIFIED 100% HIGH GRADE AMBER - which means these are the best amber necklaces you can buy for your baby! We pay more to buy the highest grade of amber, which means every necklace has larger beads and the strongest concentration of the natural healing oil, succinic acid. We are also registered with the international certification company AGbA Amber and that means every amber product will come with an authenticity label and unique traceable serial number. 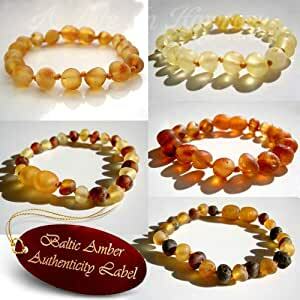 IN THIS LISTING - You will receive a RAW BALTIC AMBER BABY BRACELET/ANKLET (13-16cm), in a choice of 7 colours. For young babies, the bracelet will be an excellent fit around the ankle & when they have outgrown the bracelet around the ankle, it can be swapped to the wrist to continue receiving the benefit ★ RAW AMBER provides the strongest healing - polished see-through beads are far more common but polished amber goes through a chemical cooking process where it loses some of its natural oils. Safety warning Must only be worn under adult supervision. "FANTASTIC! Daughter slept through the night for the first time in weeks! Thanks!" "Love them, my baby is responding fantastically!!! No more sleepless nights :)"
"BEST THING EVER! Baby slept all night toddler not as cranky, beautiful + amazing"
"Excellent, since putting on daughter her red checks disappeared, a lot happier"
Baltic Amber teething necklaces & bracelets have been a European secret for centuries. They are widely used throughout the world as a natural remedy to relieve pain and discomfort and help your baby go through the painful teething period drug free! Baltic amber bracelet/anklets are commonly used to help a new born baby naturally relieve common stomach issues like bad gas and colic, relieve problems with digesting food and pooping, and to be a calmer and happier baby! Then once your baby reaches 6 months of age, the bracelet/anklet becomes a great addition to an amber necklace which is used by parents throughout the world to relieve pain through a baby's teething period. - As part of a large wholesale company, there is no middleman - you get the best value!